I really don't get the appeal. I mean, honestly. Not even at all. Not because I'm a Democrat, because I don't self-identify that way these days. I find that party faintly embarrassing a significant portion of the time. Not because I'm a liberal, because, hey, liberals bend over backwards to try to find reasons the other guy might have a point. It's what we do. It's our superpower, and our hubris. But because I love to tell stories. As part of the process of writing, I create characters. Or rather, I find myself getting to know them as they live into the tale I'm telling. Here's what fuddles me: as a writer and storyteller, I just can't figure out how anyone...anywhere...thinks the man who is president is the hero of the story we're telling ourselves together right now. Cast against the narratives of the science fiction I have loved since a boy, it's not hard to recognize the figures he most resembles. 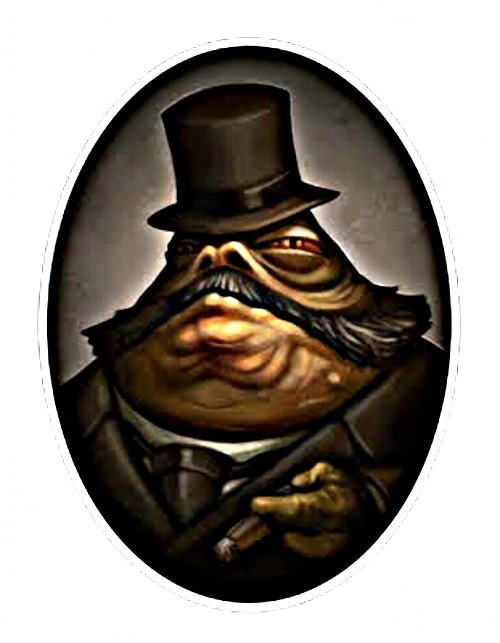 A Hutt, perhaps at some early stage of the evolution of that species. A Ferengi with a hairpiece, perhaps. He's certainly got the Ferengi skin tone down. Or Jean Baptiste Emmanuel Zorg, his name glowing in lights at the top of Zorg tower, as he revels in and profits from the chaos he creates. An entertaining persona, without question. But not a hero. Perhaps Daddy Warbucks, in that he is rich and by the frame of that old story, rich is good. But that's as far as the comparison goes. Daddy Warbucks had the good grace to let himself go bald, the cartoon character looking rather less cartoonish than the flesh-and-blood man. I go to spy thrillers, and here we have a morally questionable businessman who surrounds himself with beautiful women, is opposed by the CIA and MI-6, and took power with the support of the KGB and Russian operatives? If this were an Ian Fleming novel, we know which side James Bond would be on. Although there, while Fleming wasn't known for the subtlety of his characters, I'm not sure our POTUS-hair passes Bond-movie muster. Even in the Roger Moore era. I go to tales of the supernatural, the character that pops most cleanly is Greg Stillson, the temperamental charismatic populist from the Dead Zone, who surrounded himself with bikers and flags and wandered around with a construction hat on his head. Only Stillson, well, at least he was a senator first. I go to history itself, the story of humankind thus far, and there are other characters like him. No, not Hitler. Sweet Lord Jesus, everyone isn't Hitler. He really is nothing at all like Hitler as a person. But he's a whole bunch like Mussolini. Now, I'll admit, there was always something faintly appealing about Il Duce. He wasn't as coldly evil, and occasionally sympathetic in his needy posturing bravado. But he wasn't a hero. And when I go to my sacred book, the story of stories that is the narrative foundation of my Christian faith, it doesn't get any easier. Though he may share an appetite for women, he's certainly not David, the warrior poet with a soft heart. David felt guilt. David had a passionate, intense, anguished faith. Though he builds things, he is also not Solomon, because wisdom understood in Biblical terms is careful, measured, and magnanimous. Wisdom builds bridges. Wisdom is not disruptive or impulsive. And he is the self-evident antithesis of Jesus of Nazareth, and bears no resemblance to Paul or any other of the disciples or apostles. He's like Nero, a man of appetites, a natural entertainer, beloved by the masses and despised by the erudite and the learned. He's like Herod the Great, with his messy family and his moods and his ego and his reputation for building big gaudy edifices to himself. Hmmm. Now that I think about it, maybe Herod...not Antipas, but the Great...is the closest scriptural analog. He certainly was committed to making Judah Great again, and was equally the puppet of a foreign power. But the Herodians were not...cough...not the heroes of the Bible. So maybe we're looking at a mashup of Jean Baptiste Emmanuel Zorg, Herod the Great, and Benito Mussolini, in a tale told by Ayn Rand. Still not the sort of story I'd think we'd want to have a hand in writing.